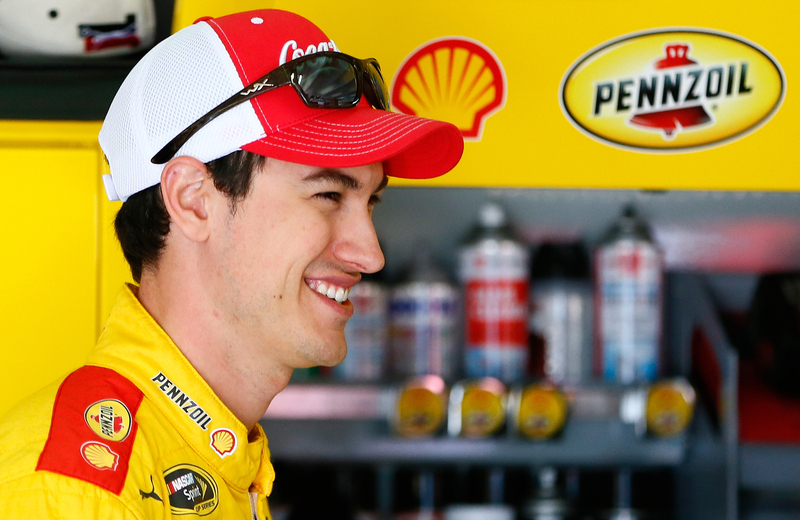 Joey Logano, driver of the #22 Shell Pennzoil Ford, stands in the garage during a testing session at Atlanta Motor Speedway on February 26, 2015 in Hampton, Georgia. Car 22 Joey Logano Shell Pennzoil Ford followed up his best year of 2014 with a stirring win in the Daytona 500 becoming the second youngest driver to win the Great American Race at 24 years old. Now he looks to accomplish another rare feat: Back-to-back wins in the season’s first two races. It’s only happened five times since the NASCAR Sprint Cup Series’ inception in 1949, the last by Matt Kenseth in 2009. The five drivers to do it were: Marvin Panch (1957), Bob Welborn (1959), David Pearson (1976), Jeff Gordon (1997) and Kenseth. On the outside looking into the Chase Grid heading into Atlanta last year, Kasey Kahne desperately needed a win in one of the final two regular season races to qualify for NASCAR’s playoffs – the Chase for the NASCAR Sprint Cup. Kahne seized the lead with two laps left in the race and sped to Victory Lane, punching his ticket to the Chase. With a repeat Atlanta win in Sunday’s Folds of Honor QuikTrip 500, Kahne can race pressure free until the Chase opener on Sept. 20 at Chicagoland Speedway. He boasts three victories at Atlanta Motor Speedway – his second-most at any track – in addition to 2 poles, 7 Top 5s and 9 Top 10s. Jeff Gordon, driver of the #24 3M Chevrolet, stands in the garage during a testing session at Atlanta Motor Speedway on February 26, 2015 in Hampton, Georgia. 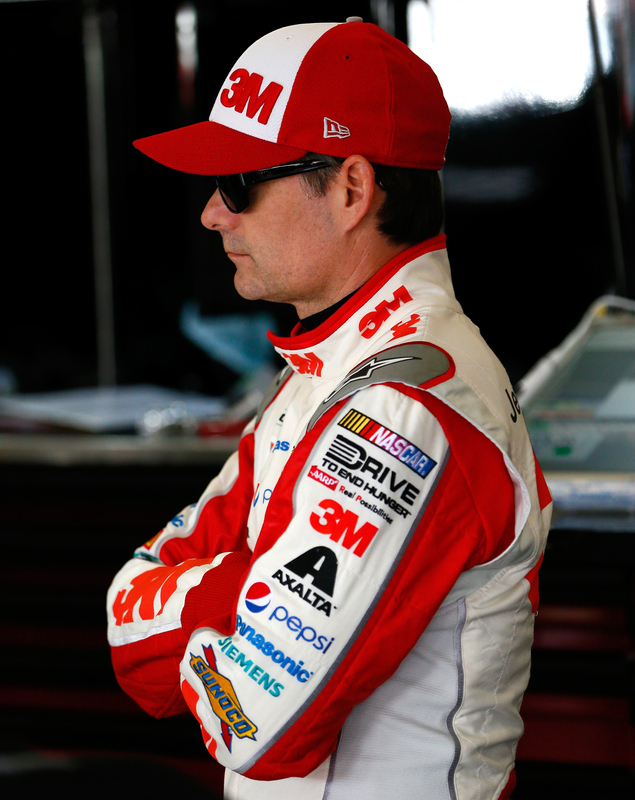 Jeff Gordon goes back to where it all began this weekend for perhaps his final race at Atlanta Motor Speedway. Gordon made his NASCAR Sprint Cup Series debut in the 1992 season finale at AMS, sprouting a storied career highlighted by four championships and 92 wins entering his last full-time campaign. The No. 24 Hendrick Motorsports driver placed 29th in the Hooters 500 that November afternoon, a finish he has rarely replicated since. Gordon leads all active full-time drivers with five wins in his 41 starts at AMS. He also boasts 16 Top 5s (39%). 26 Top 10s (63.4%) and 2 poles. The 1992 season-ending Hooters 500 at Atlanta Motor Speedway was the final race for NASCAR icon and inaugural NASCAR Hall of Famer Richard Petty – and the first NASCAR Sprint Cup race for sure-fire NASCAR Hall of Famer Jeff Gordon. An early-race wreck relegated Stewart to a 42nd-place finish and extended his winless streak in the Daytona 500 to 17 races. Still, it wasn’t his worst finish ever in the Great American Race (he’s finished last, twice). And, in all likelihood, he’s never going to catch Dave Marcis’ record of 33 Daytona 500 starts without a win. There are bright sides all over the place. And though he wrecked out of last year’s Atlanta race and finished 41st, that’s just one blip in an otherwise strong career for Stewart at Atlanta. In 27 starts, Stewart has 3 wins and 15 Top 10s. Both Buschs are also going to miss Atlanta Motor Speedway, Kyle Busch for a broken leg & Kurt Busch for his suspension. Car 16 Ryan Reed Lilly/American Diabetes Association Ford & Car 60 Chris Buescher Kellogg/Cheez-It Ford performances on NASCAR’s biggest stage were incomparable. 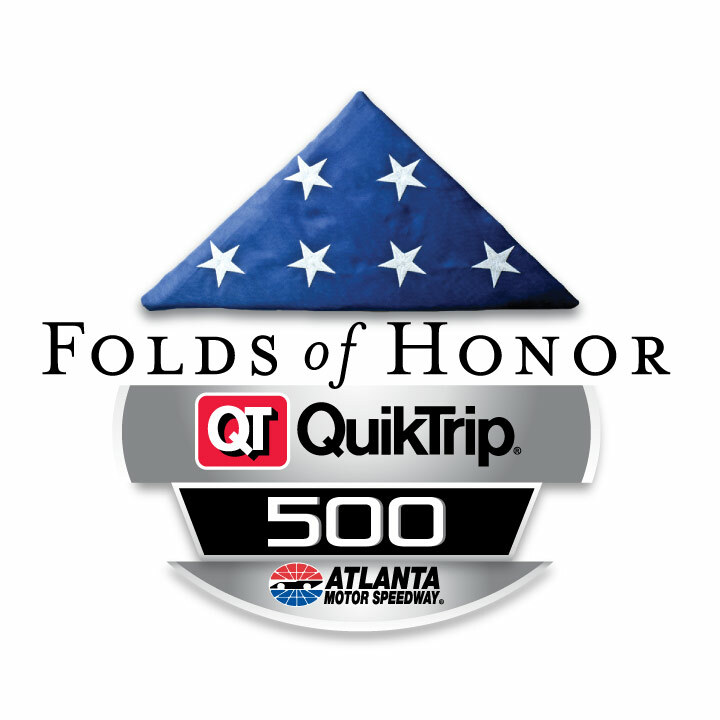 Their 1-2 finish puts the spotlight squarely on the young Roush Fenway Racing drivers as the series heads to Atlanta Motor Speedway. At 21 years of age, Reed not only has all the attributes of a young superstar, but also the qualities to be an inspiration for young people with health challenges all over the world. Four years ago Reed was diagnosed with Type 1 Diabetes and was told by doctors he would never race again. Through perseverance and a very stringent diet and lifestyle he was able to work his way back to competition and ultimately win at Daytona International Speedway. Reed has made one start at Atlanta, starting 12th and finishing 18th. He has a pre-race driver rating of 66.9 and an average running position of 20.2 heading into Atlanta. Chris Buescher led the series in pre-race driver rating heading into Daytona this past weekend and backed it up with a second-place finish. He has made two starts at Atlanta, posting his best finish (13th-place) last season. Buescher has a pre-race driver rating of 82.1 and an average running position of 14.0 at Atlanta. It’s no surprise the fans love to see the biggest stars in NASCAR and this weekend will be no exception. 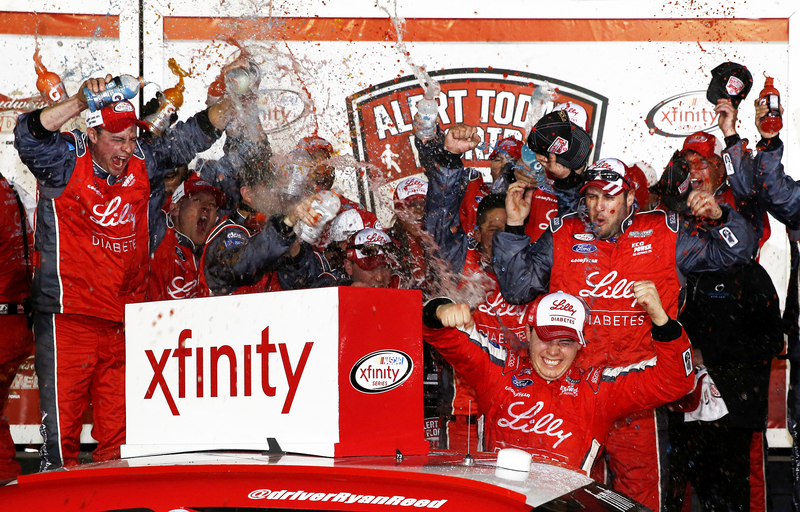 Six NASCAR Sprint Cup Series drivers – Matt Kenseth, Paul Menard, Kyle Larson, Kevin Harvick, Sam Hornish Jr. and the 2015 Daytona 500 champion Joey Logano – are all scheduled to join the NASCAR XFINITY Series this weekend in the Hisense 250 at Atlanta. 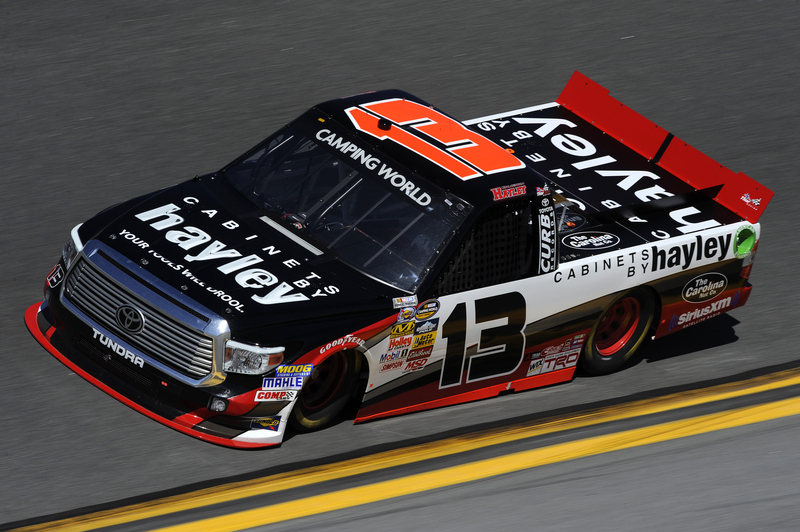 The NASCAR Camping World Truck Series (NCWTS) returns to Atlanta Motor Speedway on Saturday, Feb. 28 (5:30 p.m. ET on FOX Sports 1). The Truck Series has not raced at Atlanta in March since 2010 when Kevin Harvick took the checkered flag from the fourth starting spot. 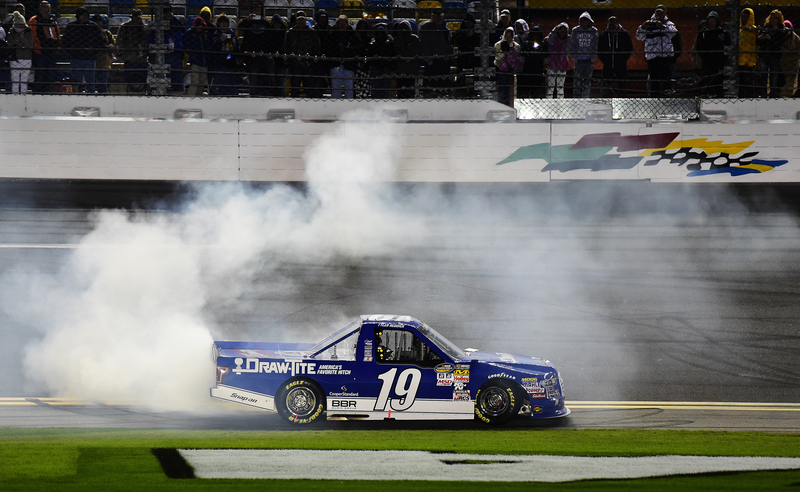 Kyle Busch holds the NCWTS record with four wins at AMS. Truck 19 Tyler Reddick DrawTite Ford started his 2015 season with a bang winning his 1st NASCAR Camping World Truck Series race in the NextEra Energy Resources 250 at Daytona. Reddick will run a full schedule this season for Brad Keselowski Racing. Fresh off his NASCAR Sprint Cup Series debut – an 18th-place Daytona 500 finish as a sub for Kyle Busch – Matt Crafton will transition back to his Truck 88 Toyota Tundra from the Car 18 Matt Crafton M&M’s Crispy Toyota. Crafton began his quest for a NASCAR Camping World Truck Series “three-peat” with a strong eighth-place finish in the Daytona opener before flying back to the “World Center of Racing” from North Carolina to drive for his injured friend/NCWTS counterpart. “There’s nothing like getting a phone call at 7 o’clock at night, saying you’re going to race in the Daytona 500 tomorrow, are you ready? ‘Oh I’m absolutely ready, I’ve been waiting for this my whole life,’” Crafton said. Fun fact: Crafton was a groomsman at Busch’s wedding. The NASCAR Camping World Truck Series has long been a proving ground for young drivers to test their talents against grizzled veterans. This season is no exception. Eleven drivers are in contention for Sunoco Rookie of the Year honors in the NASCAR Camping World Truck Series this year. In only the first race of the season, 3 of the Top five drivers at Daytona were Sunoco Rookie of the Year candidates: Truck 4 Erik Jones Toyota (second), Truck 29 Austin Theriault Cooper Standard Careers for Veterans Ford (fourth) and Truck 07 Ray Black Jr. ScubaLife.com Chevrolet (fifth). Fellow rookies Truck 08 Korbin Forrister Tilted Kilt Chevrolet (12th at Daytona), Truck 23 Spencer Gallagher Allegiant Travel Chevrolet (21st), Truck 13 Cameron Hayley Cabinets by Hayley (23rd) Truck 14 Daniel Hemric California Clean Power Chevrolet (26) and Truck 54 Justin Boston BitPay Toyota (29th) will attempt to catch up to the pack this Saturday at Atlanta Motor Speedway. NASCAR’s future was on full display at New Smyrna Speedway’s 49th Annual World Series of Asphalt Stock Car Racing. 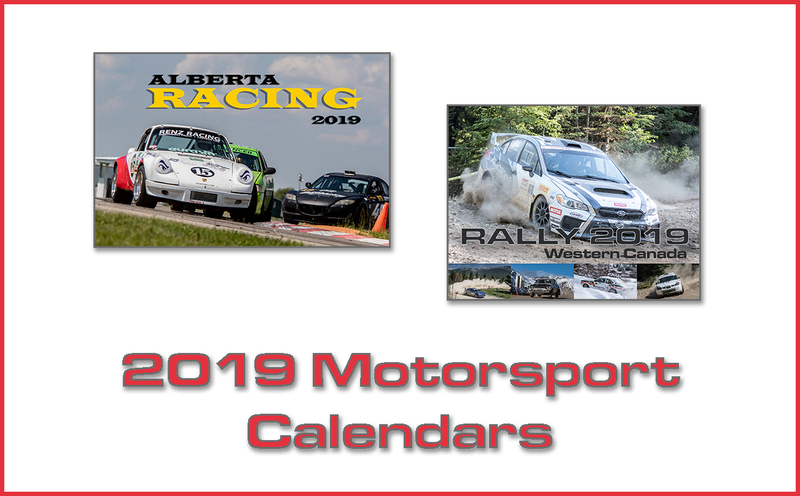 The nine-night event ran at the .48-mile high-banked NASCAR Whelen All-American Series track in conjunction with the 2015 Speed weeks at Daytona International Speedway. Christopher Bell, 20, won his first NASCAR Super Late Model race on Saturday night in the Bruce Gowland Memorial 100 finale. The Norman, Oklahoma, driver won 24 times last year in open-wheel Midget competition and raced three times at the World Series for Kyle Busch Motorsports. Runner-up Harrison Burton, 14, picked up a pair of wins on the week. They were the first two NASCAR Super Late Model wins for the son of former NASCAR Sprint Cup Series driver Jeff Burton. Zane Smith, 15, claimed the World Series title for the Super Late Model Division on the strength of one win and an average finish of 5.8 over the seven races. In addition, NASCAR K&N Pro Series East driver David Garbo Jr., 18, had a win and 17-year-old Natalie Decker, who will run a Late Model for NASCAR Drive for Diversity and Rev Racing this year, had four top 10s. Dalton Armstrong, 20, won the NASCAR Whelen All-American Series Division II Pro Late Model title. Armstrong, a former USAC Midget Car driver, is the younger brother of NASCAR XFINITY Series driver Dakoda Armstrong. NASCAR Next driver and 2013 NASCAR Whelen Modified Tour champion Ryan Preece, 24, won the World Series title for the tour-type Modifiers. Preece had four wins, including the extra-distance finale — the Richie Evans Memorial 100 on Friday.